Of course disaster awaited when I return from a week spent overseas. 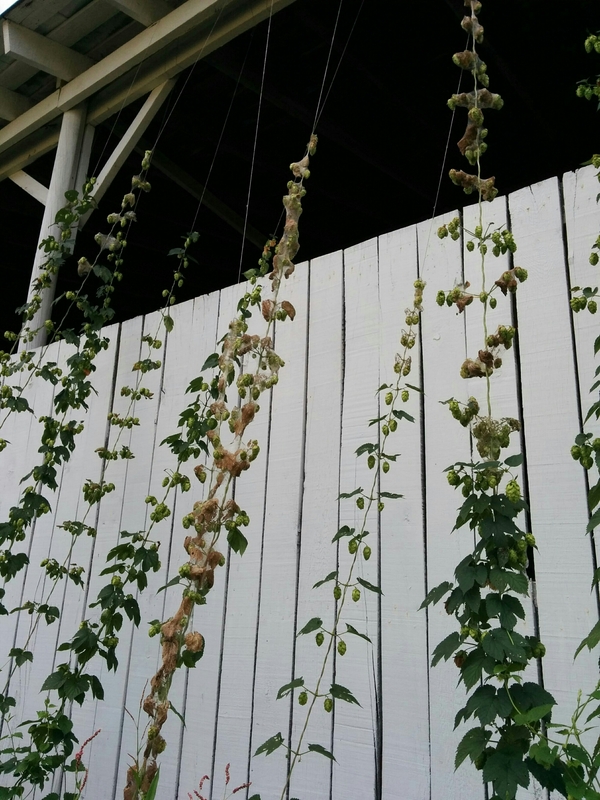 One hop plant is completely ruined while many of its neighbors are anywhere from 10-60% ruined. While I was away, these caterpillars moved in and set up their tents around the hop leaves and my ripe cones. Furthermore, black specs are clearly visible in the image that are either aphids or caterpillar dung. I have id-ed then as Fall Web worms which is strange as they are normally only found on trees. Hence I’m not 100% confident in my identification. However, I did have many allies working to drive off the infestation. Six mantises and numerous spiders were observed. Yet, the tide of the battle was in the favor of the pests thus action is needed on my part. So for the first time ever, I have had to resort to an -icide. Even still, I will only utilize a targeted approach. Since there were many allies that I did not want to harm like the spiders, mantises, predatory wasps, assassin bugs and lady bugs, I needed to find something caterpillar specific. Consider the fact that these hops are ready for harvest and use in beer, I also want something that won’t poison my beer. Enter Bacillus thuringiensis kurstaki (Btk) . BTK Is unique in that it is a bacteria that occurs in soils just about everywhere and is only known to work on leaf eating caterpillars and worms. More importantly, it is safe for human consumption and anecdotally, the bottle of concentrate smells exactly like the yeast cake in the bottom of my fermenters when a batch of beer is complete. It can be applied right up to the day of harvest. We will see how this goes. I applied the BTK in the evening shade as sunlight immediately begins weakening and killing the bacteria. If I had to guess, I’d wager all they hops under the tents are a lost cause but time will tell!